Participants come to the study center on weekdays, in general between 8am-9am after an overnight fast. They are allowed to drink water and to take their usual medication. They are welcomed by one of the medical assistants or study nurses, and the study procedures are explained. Total duration of the ‘check-up’ is 2h-2h30. First of all, the blood pressure is measured on both arms as shown in figure 1. For blood pressure measurement, the A&D UM-101 (A&D Company, Ltd., Toshima Ku, Tokyo, Japan) is used, a non-mercury manual auscultatory sphygmomanometer. This device has the same precision as the classical mercury sphygmomanometer, and has replaced the latter for ecological reasons. Body weight and size are measured, followed by the abdominal circumference. Of note, measurement of these parameters are used-among others- to calculate the so called ‘Body Mass Index (formula= body weight (kg)/ (length in meters). The BMI allows the classification into different categories of weight: <20 underweight, 20-25 normal, 25-30 overweight, and ≥30 obese. The hand grip strength of the right and left hand is measured three times with the ‘Baseline Hydraulic Hand Dynamometer®’ (see figure) with subjects in a standing position. Subjects hold the dynamometer at thigh level and are encouraged to exert the strongest possible force, each time for several seconds. Hand grip strength offers information on muscle mass and nutritional status. HSG is of special interest in older individuals (>65 years), since some studies have shown that reduced HSG is associated with an increased risk of mortality. 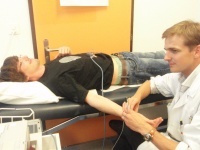 Bioelectrical –impedance analysis (BIA) is a non-invasive technique which allows assessment of body composition (fat mass, muscle mass, hydration level) in a few seconds. Two electrodes are attached to the right hand and the right foot, and the bio-impedance (Ω) to a very weak electric current between the electrodes is measured, which allows on its term body composition assessment. Moreover, basal metabolic rate and the estimated daily caloric need are calculated using an incorporated algorithm. An electrocardiogram (ECG) is obtained with the SDS-104 device from Schiller. ECG measures the electric activity of the heart, and provides essential information on heart functioning, such as heart rate, eventual ischemia (lack of oxygen) and/or hypertrophy (muscular over-development of the heart). The ECG is part of the medical report that is given to all participants the day after during the home visit, and a copy of the medical report is sent to the treating physician, if wished by the participant. Venous blood sampling is performed. Approximately 70 ml of blood is drawn from a forearm vein, which corresponds to about the same volume as half a cup of coffee. Blood sugar level, cholesterol profile, electrolytes, whole blood count (including red and white blood cells and platelets) and liver-and kidney function tests are dosed in the blood on the same day, and results are mentioned in the medical report. More specialized tests such as dosage of hormones implemented in blood pressure regulation and renal sodium handling are performed in a later stage. In order to study the elastic properties of the arteries in a non-invasive way, a so called pulse wave analysis is performed, using a Sphygmocor device (AtCor Medical Pty. Ltd., West Ryde, Australia). Briefly, a small tonometer measures elasticity of the right carotid, radial and femoral artery, by applying a little bit of pressure at the corresponding anatomical regions. Total duration of this exam is 15 minutes. The elasticity of the artery influences the pulse wave velocity (PWV), which on his term correlates with the global degree of atherosclerosis (‘calcification’ and formation of cholesterol deposits in of the artery wall) of the participant. Atherosclerosis is the main culprit of arterial narrowing and eventually occlusion, which leads to heart infarcts or cerebral infarcts, depending of which arteries are affected. Besides, the Sphygmocor device provides an estimation of the blood pressure in the aorta (‘central blood pressure’). The central blood pressure is a more precise predictor of future cardiovascular events than the blood pressure measured at the arm, and experts believe that it will become an essential tool to take therapeutic decisions regarding blood pressure treatment in the future. Abdominal ultrasound is performed in every participant. This is one of the reasons that participants should come after an overnight fast, since visibility is reduced after meals. The ultrasound exam is painless, free of irradiation, and without known side effects. Of note, it is the only radiological exam than can be safely performed throughout pregnancy. In SKIPOGH, the ultrasound focuses on the kidneys, since kidneys are key regulators of blood pressure. Kidney size, volume, and vascular properties are therefore measured in detail. Other organs such as the gallbladder, liver and prostate are briefly visualized, and an estimation of the aortic diameter assessed. In case of the detection of an anomaly (cyst, kidney stone, other), the participant as well as his/her treating physician is informed without delay. After the abdominal ultrasound, a Diasys® device is installed on the non-dominant arm, which measures every 20-30 minutes the arterial blood pressure. The participant leaves the clinic with the Diasys® device, and will collect all urine produced the same day and night in two separate urine containers. Finally, a questionnaire is filled in at home by the participant (duration: 30 minutes). The questionnaire includes question s on previous medical history, medication intake, professional life, and life habits (alimentation, physical activity). The following day, a home visit is performed by a study nurse. Home blood pressure is measured five times, the questionnaire is revised by the research nurse, the Diasys® device removed and urinary containers collected. The research nurse will also hand over the medical report to the participant, mentioning that in case of questions, the participant should not hesitate to contact the responsible physician of the study center. This page was last modified on 22 December 2015, at 13:16.